Have you ever watched your child as she sits in the middle of a toy pile, bewildered, not knowing what to play with? She may pick at a few things, but eventually gives up and goes to play with the door stop. But... give your child a choice between a few things and he will happily play with them for a while. Kids don't need, or even want, 432 toys to choose from during play time. Plus, if they see all of their toys on a daily basis, they will get sick of them (whether they play with them or not). This is why I rotate toys. The concept is very simple. 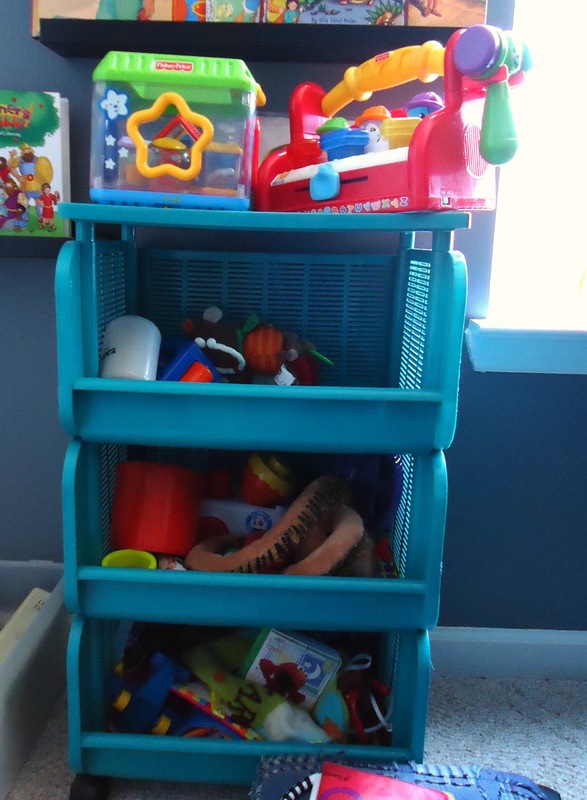 Put a portion of the toys away, and only let your child play with a select few at a time. My child has quite a few toys (we just had Christmas and a birthday). I have his toys split into 4 different groups, and he still has PLENTY to choose from. Note: Although this is out in Baby's room here, it's home is actually in the closet. So, he really doesn't see the toys until I rotate them in. I keep a set of toys in each of the bins, and Baby plays with the fourth set. Big toys go in the toy box, and stuffed animals are kept in a pop-up hamper. The plan is to switch to a new set of toys every 2 weeks or so. Then...Ta-Da! New toys, Baby! He also has books and sensory toys that I let him use supervised. Yes...he has to be supervised with his books because he literally eats them (yes bites, chews, and swallows). But these are not in the rotation as I simply choose what he will use when the time comes. I am aware that this isn't actually minimizing, since I did not actually get rid of his toys. But, I feel like it gives a sense of minimalism, anyway. Plus, there is less to clean up, at the end of the day.